Bikes and coffee go hand-in-hand. Many of us wouldn’t even dream of attempting a dawn patrol ride without copious amounts of go-go juice. Here are some of our favorite coffee-related gifts with a cycling twist. 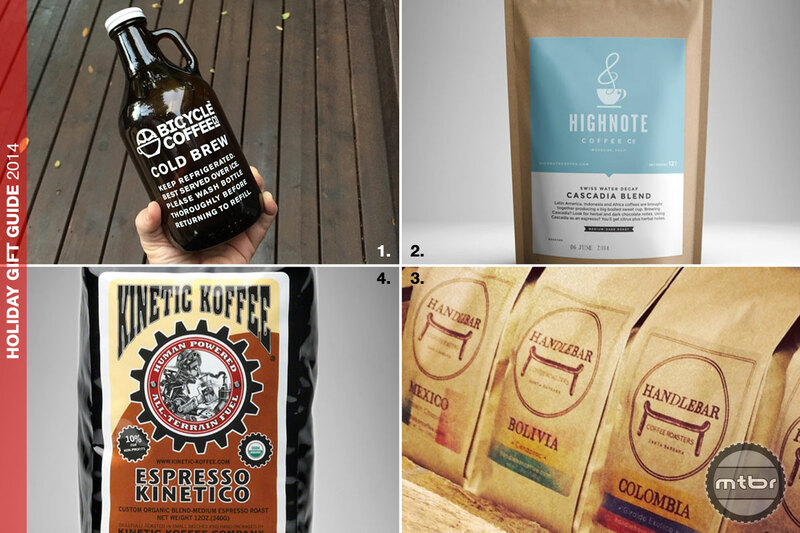 Each of the following companies have great, bike-themed bean for sale online–a perfect gift for the cycling coffee-drinker on your list: 1. Cold brew is a great choice for the water bottle and Bicycle Coffee Company makes some of our favorite, plus they do all their local deliveries by bike. 2. We have it on good authority that Oscar Nunez of High Note Coffee roasts a special blend for Mr. Tom Ritchey himself–a bike-and-coffee guy through and through. 3. Former pro roadie Aaron Olsen slings great bean at his Handlebar Coffee Roasters in Santa Barbara, Calif. 4. The bike crazy guys at Kinetic Koffee have been making cyclists jittery for years. 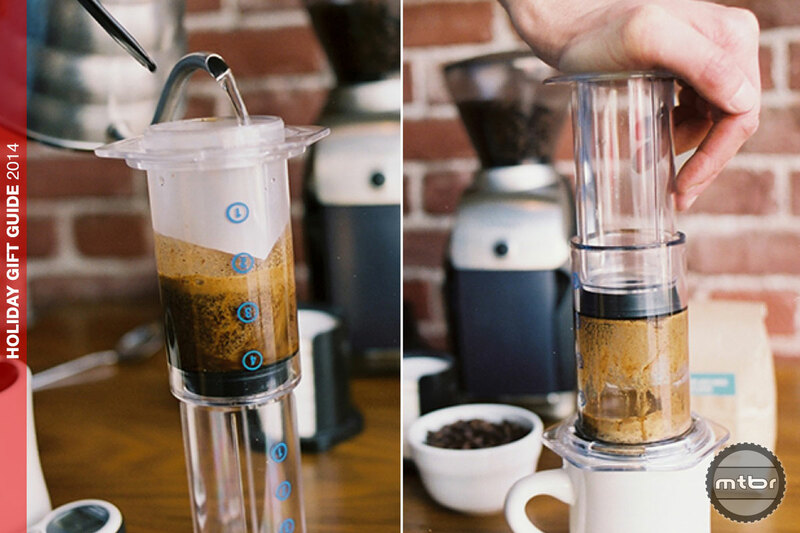 Though the Aeropress may look like some kind of male enhancement quackery, it’s actually an amazing $35 coffee press that makes espresso almost as good–though not as easily–as a dedicated $2,500 machine, minus 2,465 of those dollars. It’s so easily transported we know some bike industry types who never travel without one. 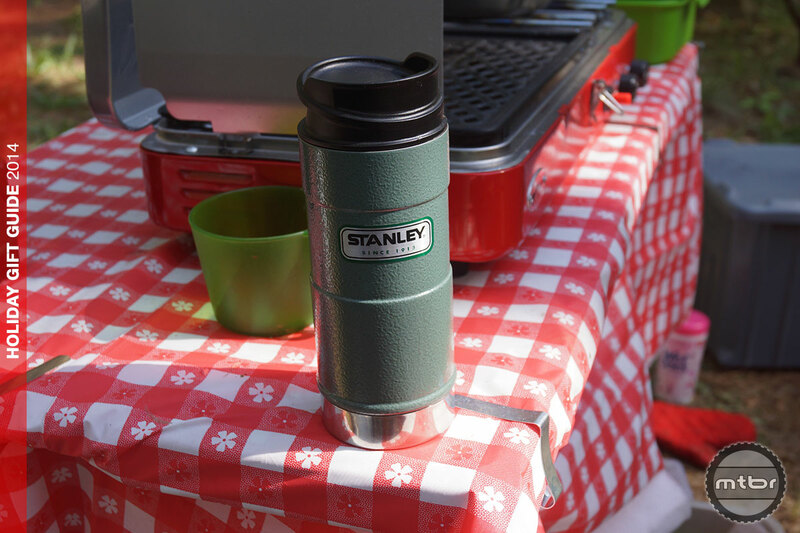 The thermagical Stanley Classic One Hand Vacuum Mug ($25 for a 12-ounce version, $30 for a 16-ouncer) keeps hot beverages hot, cold beverages cold and is tough as nails. 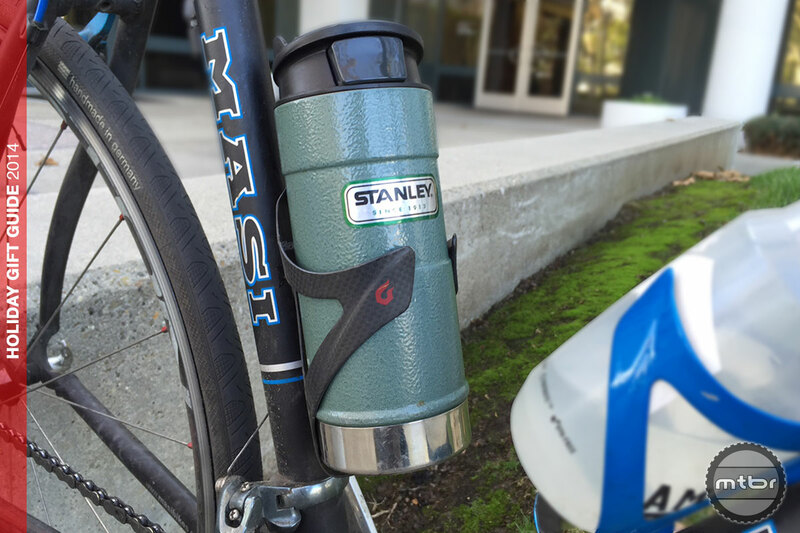 Best of all, it fits snugly and quietly in most standard bottle cages, making it our bike commute mug-of-choice. 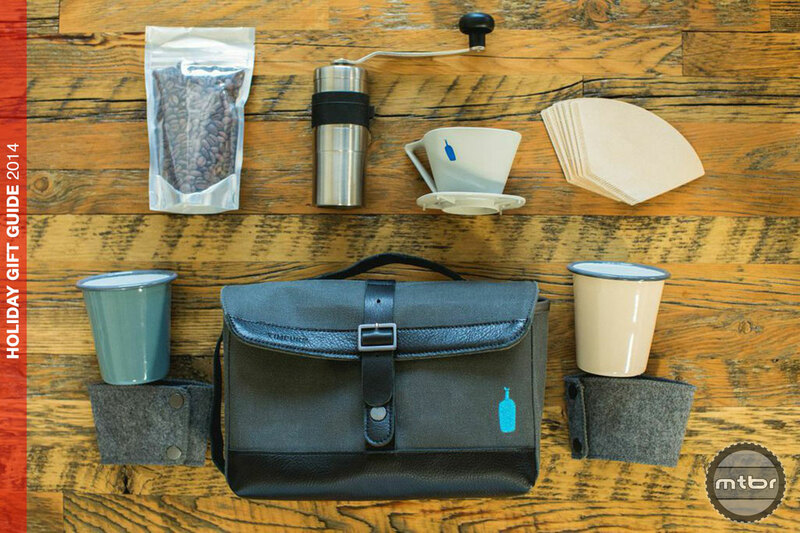 If you’re an on-the-run pour-over aficionado you’ll love the $179 Timbuk2/Blue Bottle Travel Kit that packs everything you need into a tidy, transportable package. The kit includes a hand grinder, a pair of travel drippers with filters, two enamel mugs, and a pair of “Zarfs”–snap-on thermal scarfs for the mugs. It also ships with a 2-ounce sample of Blue Bottle’s Three Africans drip blend and all packs into a felt-lined waxed canvas Timbuk2 carry bag. 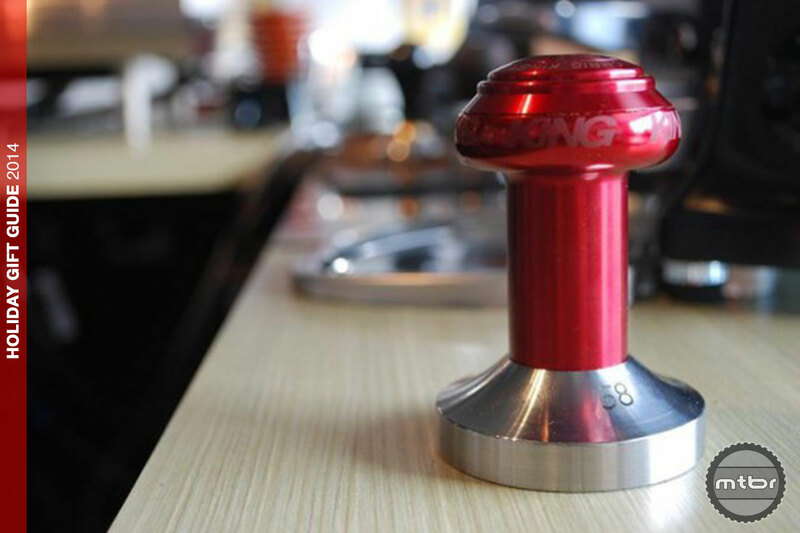 If you can afford a dedicated espresso machine then the $85 Chris King Espresso Tamper should be well within your budget. Made in the USA of stainless steel and aluminum, the King is the only tamper we’ve ever heard of that lists a stack height (83.5 mm) among it’s attributes. Hashtag bikegeekpoints. Punk rock stalwarts the Descendents have been known to sing about bikes in their music, but would be nowhere without coffee. Not only did they invent and write a song about a concoction known as a “Bonus Cup”, they also wrote this amazing 35-second-long homage to the beverage’s container. Have a look, does your coffee shop measure up? Check out our holiday gift suggestions.